Algae begins growing in the lake. Every day the algae doubles in size and it keeps increasing in that ratio. On the 48th day the lake is completely covered with algae. On what day is the lake half-covered in algae? Think about it for a moment, don’t blur out the answer just yet. The correct answer is: 47 (not 24). On 47th day the algae covers 50% percent of lake. The following day (48th) it reaches 100% (50% times 2). I got this from “Thinking, Fast and Slow” a book from Daniel Kahneman - a Nobel Prize winner in Economics - whose work focuses on the rational model of judgement and decision-making. In the book Kahneman talks about the two different systems in which we think. System 1 (the Fast system) is mostly unconscious and makes snap judgments based on our past experiences and emotions. System 2 (the Slow system) is the process by which we consciously check the facts and think carefully and rationally. It’s rational, conscious, and (painfully) slow. System 2 is harder to engage and easily distracted, while System 1 - which is easily swayed by our emotions - is wrong as often as it is right. When you ask the “‘lake question” a lot of people answer 24 — because 24 is half of 48, it's the quickest/easier answer. That’s completely normal, our brain always looks for the easiest answer; we try to get an answer without using too much energy. That's why System 1 is what we do most of the time, it’s not bad per se, it’s who we are. The challenge is strengthening System 2 as it provides better intuitive responses and makes us think more clearly and rationally. I won’t tell you how to strengthen System 2 though. You have to read the book for that — which is not only for brainiacs by the way — there are lots of interesting anecdotes as well as layman's summaries of psychological research that will leave you feeling fascinated by the brain and its capabilities. But let’s try to apply Kahneman’s systems to the world of food blogging. Say you see a picture of some particular food on Pinterest/Facebook/Twitter/Foodgawker. Usually, the first reaction you have is purely visual: does the food presented in picture look good? For instance, we tend to be attracted by things such as chocolate, gooey caramel, or melted cheese. The name of the food also plays a big part (as it briefly sums up what we are looking at.) Is it a cake, a brownie, a casserole? Based on our past experiences we like things that are delicious, comforting, and with name we like to hear. We tend to be attracted to that kind of food. The next step is clicking on the picture/link and heading over onto the website to find out what that food is all about. But we scan the ingredients and recipe directions, System 2 kicks, and we start to rationalize about it. In other words, we tend to use both systems, but it’s still System 1 that sparks our interest at first. 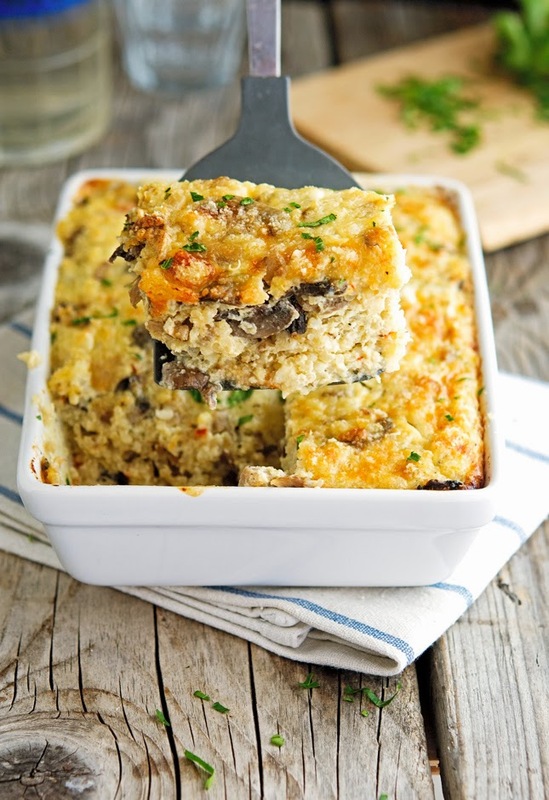 However with this Cheesy Mushroom Quinoa Casserole there’s no going wrong. You can even be totally irrational about it and I promise, you won’t be disappointed. It's pure comfort food with no guilty strings attached. 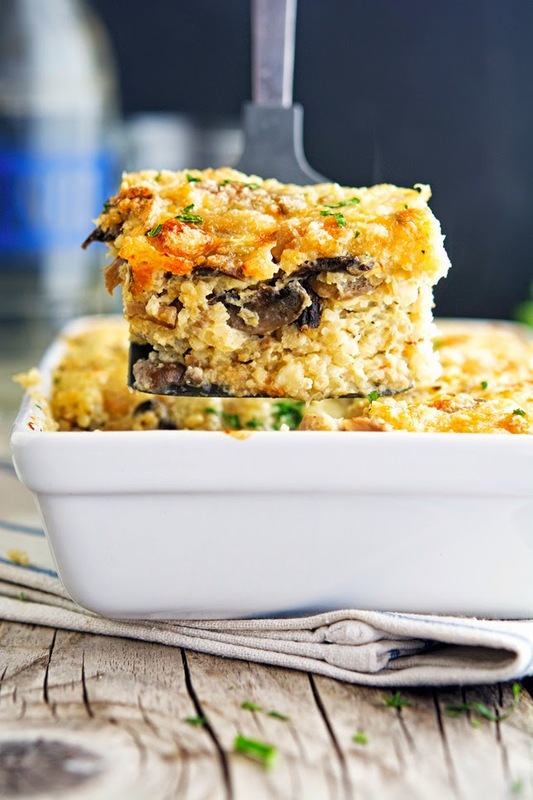 Like a big bear healthy hug of mushrooms and quinoa, with a delicious Parmesan crust. So delicious and so easy to make. Naturally gluten-free, packed with flavor, healthy and hearty. Everything a casserole should be! It’s System 1 and System 2 approved. 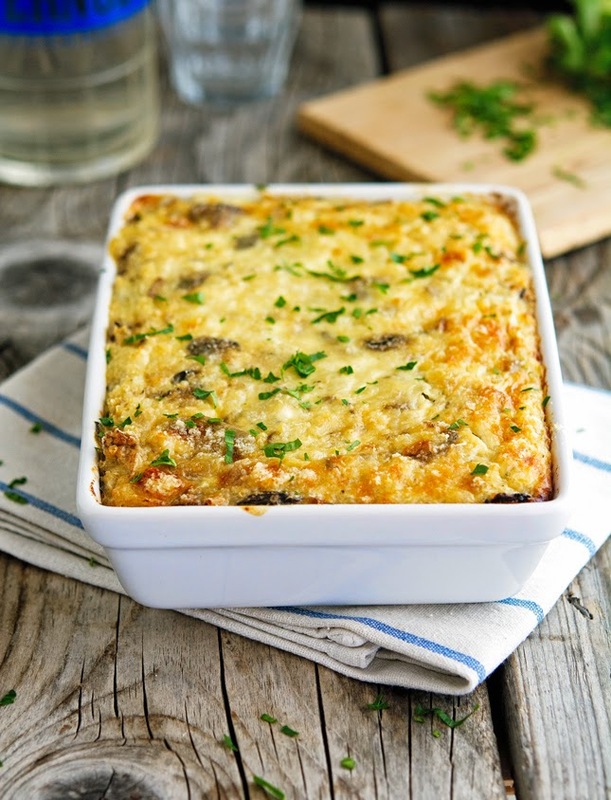 Cheesy Mushroom Quinoa Casserole Print this recipe! Rub a medium-large baking dish with olive oil and set aside. In a large dry nonstick skillet over medium-high heat, toss and toast the cooked quinoa with thyme, black pepper, and red pepper flakes (if using) for 2 minutes. Season with salt, transfer to a bowl and set aside. In the same skillet over medium-high heat, sauté the mushrooms in ½ tablespoons of olive oil, sprinkled with a couple of pinches of salt. Stir every minute or so until the mushrooms have released their liquid, about 5 to 6 minutes (depending on the quality of the mushrooms you’re using). Add the onions and cook for another 4 to 5 minutes until translucent. Stir in the garlic and cook for another minute. Remove from the heat, add the toasted quinoa and stir until combined. In a large bowl combine eggs, cheese, and sour cream. Add mushroom/quinoa mixture, stir until well combined, and turn into your prepared baking dish, smoothing it out evenly. Sprinkle with Parmesan cheese and cover with lightly greased foil. Bake in the oven for 20 minutes, remove the foil and bake for further 10 minutes or until golden around the edges. Let rest 10 minutes, then sprinkle with fresh chopped parsley and serve. One serving yields 233 calories, 8 grams of fat, 27 grams of carbs, and 13 grams of protein. Gosh this looks amazing! Look at the steam and the mushrooms - and melty cheese. Wow! And I need more coffee before thinking this hard - haha! I'm definitely guilty of using System 1 to scan for melty cheese and anything sweet and gooey! The parmesan crust sounds like the perfect combo with the creamy interior! I know right? It's the best thing ever! Nothing going wrong with this at all, absolutely love it! 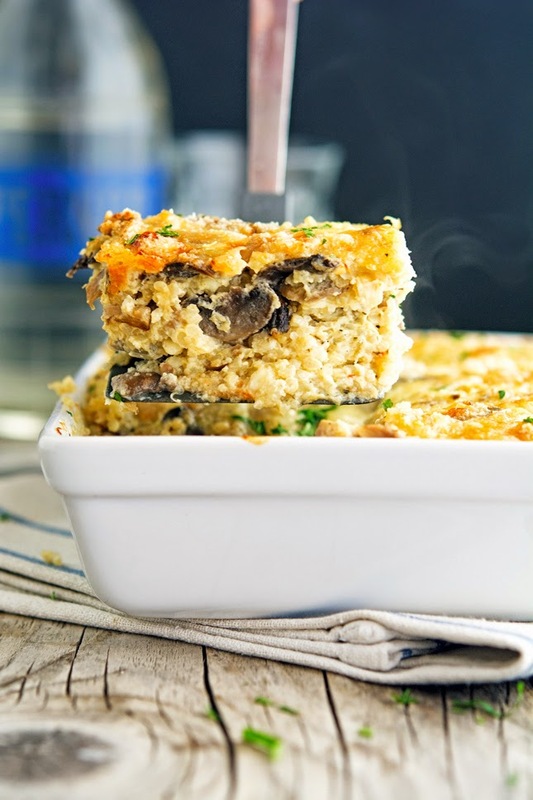 Looking good and the line "Like a big bear healthy hug of mushrooms and quinoa, with a delicious Parmesan crust." is great! I love the cottage cheese and sour cream addition here, too. I used to have a math teacher who liked to torture us (or so we thought) with "trick" questions - turns out he was just getting us to work on our System 2 thinking! This is the second recipe I am seeing with an intriguing use of cottage cheese - this sounds like my kind of casserole! I'm not big on cottage cheese but in this casserole it just works! Love this dish Mike, pinned and printed. Thank you so much C! So Mike I guess I'm one of these people who have never had quinoa before. It looks like I would not like it, however this looks like I would inhale it. I'm willing to try it now. Hahahaha, you crack me up T! Great job Susan, looks like you're a System 2 person. Good for you! Mate, you've given me a headache with that. I just got out of a logistics meeting can't even add up 1 plus 1. However, my mind isn't to fried to enjoy this recipe- Love how you used cottage cheese in it too! Although you've made an error. It says serves 6. More like serves 1. OMG a logistic meeting sounds like hell on earth. I do not envy you man, not even a bit! A cheesy casserole that's guilt free too? This is definitely a recipe I need to try! Yummm. I haven't had quinoa in a while, and this will probably be the next thing I make with quinoa :) thanks! So what's System 4? Food coma? I am completely serious when I ask this: when are you visiting Los Angeles so we can collaborate on some deliciousness?! I love LA, I need to visit soon! System 1 and 2 totally approve and are planning on Pinning this ASAP. what kind of cottage cheese do you recommend for this? like fat free or low fat? I made this over the weekend and it was great. It looked dry when I was mixing it...so I added another cup of cottage cheese and another 1/2 cup of plain yogurt (both fat free). I still think it could have been moister so, either I didn't do something right, or that's just what I prefer. Anyone else think it was on the dry side? I might also add more mushrooms next time! It was good anyway...and I took some leftovers to work for lunch. This looks amazing! I really want to try it - but I don't cook with eggs. What would be the best substitute for eggs in this recipe Mike?